This recipe was originally posted about 2 years ago. It's an old family favorite. In fact, these cookies sealed the deal with my husband when we first started dating a thousand years ago. These are my favorite holiday cookies. I got the recipe from my mom and I'm not sure where she got it from. 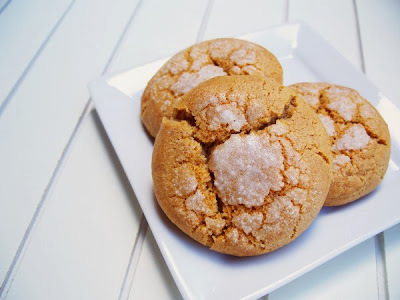 They are spicy and chewy without being one of those molasses cookies. They look pretty so they are great for gift giving. I can eat at least 4 of these at once, which is saying a lot because I generally can't eat more than one or two of any other kind of cookie I make. And that's not because they don't taste good, I'm just not a sugar fanatic. I feel sick if I eat too much of it. But these...they are like potato chips - I can't eat just one. Preheat oven to 350 degrees. Cream together shortening and brown sugar. Beat in egg and honey. Add flour, baking soda, salt, ginger, cinnamon and cloves until thoroughly mixed (dough will be stiff). Shape dough into 1-inch balls and dip one side in water, then in sugar. 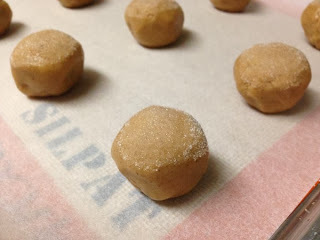 Place sugar side up, 2 inches apart on greased or parchment-lined cookie sheet. Bake for 12-15 minutes or until lightly browned. Cool on cookie sheet for 2 minutes then remove to wire rack. Makes a little over 2 dozen cookies.